Trust our developers to code your site and convert PSD to Responsive make it compatible across all devices and browsers. Avail our transparent process of converting your designs from PSD to WordPress that is fast and SEO friendly. We can convert your PSD to the next level. We will convert your PSD design into a full-fledge hand-coded W3C validated, multi-browser compatible, pixel perfect HTML / CSS mark- up in quick turnaround time. Ask for our services to convert your static PSD website into a fully mobile compatible and responsive SEO friendly WordPress website to improve your SEO ranking. We will create your website with capabilities to automatically scale and adapt to different mobile friendly screen sizes and to Bootstrap development. Our developer team will get you the best email templates for the best email marketing needs with some supreme code quality and compatibility across all email clients at affordable prices. 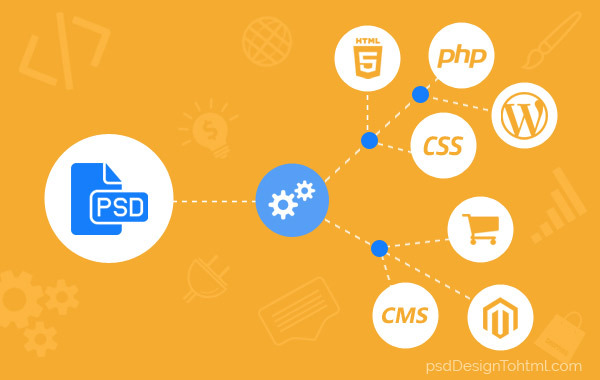 Integrating modern technologies with proven methodologies to bring up an innovative site with a variety of features, PsdDesignToHtml works in accordance with your strategies and objectives. With a strong and experienced team of designers and developers, we have been delivering superior quality PSD to HTML5 conversion services to our clients from across the globe with flawless consistency. Our expert developers focus on frond-end development and turn your Photoshop designs into hand-coded, pixel perfect, cross-browser compatible W3C validated HTML/HTML5 markup. Assuring you of result-oriented solutions that will work wonders for your business, our agency makes sure that your investment in our services puts you on the right path of growth. Our developers are always geared to take up new challenges of the wavering market and we leave no blemishes in web development. We know most of your customers view and browse your website on their mobile devices while they are on the move. Are you confident that they can buy your services easily on their devices with ease? Contact us. Our experts understand the crucial necessity of an HTML responsive design and are ready to put their best efforts and convert photoshop designs to Bootstrap. Conversion to HTML code to build a responsive website has become a necessity today. It is our job to convert psd to e-commerce website. We are specialists in slicing, cropping photoshop files and converting them into usable JPG/ PNG files and provide you with a responsive mobile-friendly website and applications. At PsdDesignToHtml, our WP professionals adapt to the latest technologies and convert psd to responsive WordPress theme that is fully-functional meeting all your requirements. The theme will have compatibility with all devices and browsers and comes with an easy to use advanced theme control panel to manage all text and sections. Our agency is also proficient in converting your photoshop files to the other popular CMS platforms like Joomla, Drupal, Magento etc. We also convert your static HTML website to WordPress. Our coding experts adopt a pixel-perfect, coding technique which will enable your visitors to access your site across different browsers and web servers from any location. We deliver fully SEO semantic markup that will boost conversion rates. We are acknowledged for our quick turnaround time. Give us all your designs and we will take care of the rest. We are highly competitive in our prices. The guys at PsdDesignToHtml are amazing. It was a pleasure working with them when I took up their services to build fully customizable WordPress themes from my designs. I will recommend PsdDesignToHtml for their coding services. I enjoyed working with them on my project and am thoroughly impressed with their codes. They are very knowledgeable and they have replied to all my queries instantly. I love their dedication and team spirit. I want to thank the entire team of PsdDesignToHtml in their efforts to help us deliver many high quality and unique websites to our clients. It is a remarkable effort from their side. I will again want to work with them soon. Well done. Keep it up.